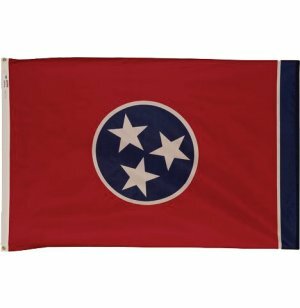 Having a Tennessee State Flag right outside a school or office building will make those who live in The Volunteer State feel right at home. The vibrant, patriotic flag design will also add some color to your space. Display your state pride right in front of the building with an Outdoor USA State flag. These flags are designed to wave gently outside on your flagpole. They are made from nylon which blows beautifully in the breeze, is easy to clean and retains its color well. 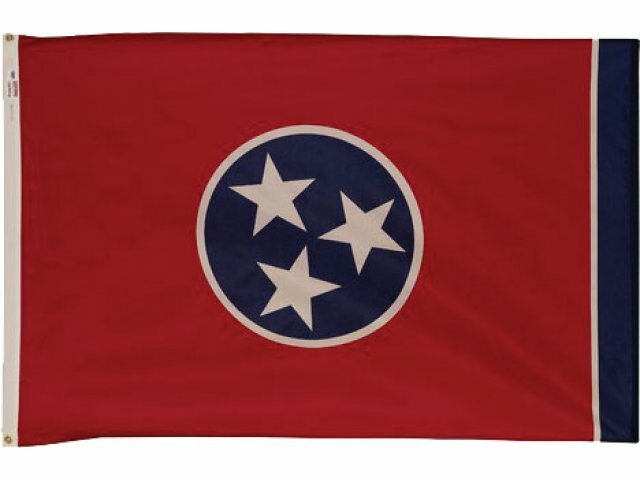 With the reassurance of long-term durability, you can feel free to display your state flag as often as you like. These user-friendly American state flags are easy to hang and display. Brass grommets let you attach them to a flag pole, pin them on a bulletin board or hang them in many other ways. No matter where you are, a US state flag can help your employees or students feel proud of where they come from. State Pride: State flags encourage state pride and an appreciation for history. Durable Materials: Nylon retains color well, flies nicely in a light breeze, dries well and is easily cleaned. Easy Hanging: Brass grommets let you hang your flag from a pole and a number of other places. Note: Flag is not designed to be flown in inclement weather.